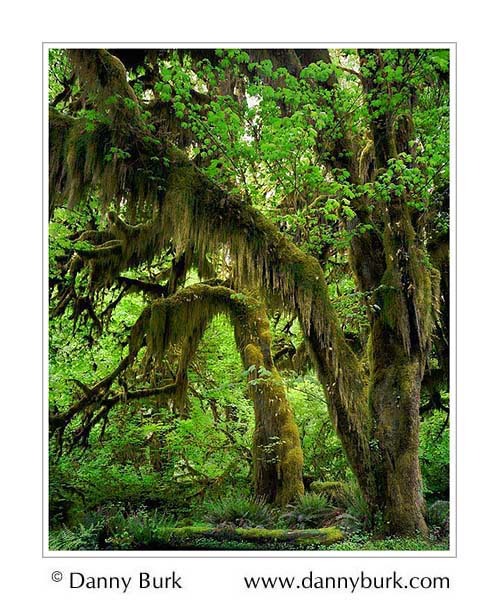 I've wanted to visit the Hoh Rainforest in Olympic National Park, Washington since I first saw it in photographs when I was 5 or 6 years old. One of the few temperate rainforests in North America, it's a place of incredibly lush foliage, green and mossy almost beyond belief. I finally made the trip in May 2005, driving over 3 days from Indiana, and discovered that it's not called a rainforest for nothing. I did my homework before the trip, checking on weather patterns with friends who live in the Pacific Northwest. The usual conditions are fairly dry during winter months, followed by a very wet spring through April, and again less rainy through the summer. I planned my trip carefully, choosing the second half of May: lush greenery would be the rule, with expected periods of the soft overcast light needed to photograph the forest. Rain would lessen after April, and late May would also give me a bonus of blooming rhododendron when my travels dipped south to California's Redwood National Park by the end of the month. I allotted three days for the Hoh Rainforest; even if rain extended into May, surely it would stop for at least part of a three-day span. Arriving in Washington, the forecast was grim. Rain, rain, and still more rain. And unlike the usual forecasts, this one was accurate. My first stop, a "bonus" day to look around Mt Rainier, was indeed rainier. I managed to get enough glimpses of the park through the rain and fog to see that it's a magnificent location, worthy of an entire trip in better conditions. I headed toward the west coast, hoping that the forecast of continual rain for the town of Forks, a few miles north of the Hoh Rainforest, would be wrong. In Forks, it did occasionally stop raining for brief periods. The Hoh valley is another matter entirely. It's a strange place; it seems to be set into a funnel of sorts. One can watch dappled clouds and intermittent showers along the ocean, then look toward the Hoh valley and see immobile, towering black clouds. One can drive the 18 mile road from the coastal highway to the national park, observing with increasing disappointment as lovely bright overcast turns to heavy cloud cover and finally drenching downpour as one enters the parking lot. This event happened again and again on all three days I had scheduled for the area. Determined to capture some images despite the rain, I tried my best. I resorted to various combinations of umbrellas and protective shower curtains. I managed to get a few shots in this fashion, although the constant rain created foliage movement that, coupled with slow shutter speeds due to the dark conditions, rendered it difficult to obtain sharp images. With a meagre amount of film to show for three days' efforts, I reluctantly left for my next stop, Cannon Beach, several hundred miles down the coast in northwest Oregon. Constant wind and intermittent storms met me at Cannon Beach, but I persisted and brought back photographs of unusual light and storm conditions. I continued to check weather forecasts for the Hoh Rainforest area, at last a dry day was predicted! I knew what I had to do: cancel my next day's stop at Florence, Oregon, and return to the Hoh. Back I went, confident that I'd finally get the images I'd tried so hard to obtain for three soggy, frustrating days. I knew what I wanted, having wandered the rainforest trails for days as I scouted for good compositions. Driving the 18 mile road into the park, it looked great. Soft overcast light and calm conditions; the long return trip had paid off. But what are these harsh spots of direct sun that are opening up in the forest? Not to worry; it's just a cloudless patch overhead that will soon close up. Not wanting to take chances, after parking I immediately set off to my favorite composition about ten minutes into the trail. I'd set up the camera and wait for the sunny patch to cloud over, and I'd have my shot. And I did as I'd planned. I set up the camera, composed, and was ready to figure the exposure and fire the shutter the moment the sun disappeared behind clouds. After playing hide and seek for half an hour, the sun finally vanished and I got my shot. Within thirty seconds, it started to rain again! A dribble at first, it became a downpour within minutes. I managed to get one more image composed and captured before the heavy rain started again. So much for the planned catchup day; the rain showed no sign of stopping. Returning to the coastal highway, it was dry; looking back toward the Hoh valley, the now-familiar mass of black thunderheads hung low and immobile. It was time to make the 300-mile drive to the central Oregon coast, and I didn't look at Hoh forecasts again.